Developed for capturing multiple High Definition SDI video signals, the VisionSC-SDI4 is the perfect solution to AV professionals looking to capture from multiple SDI sources. 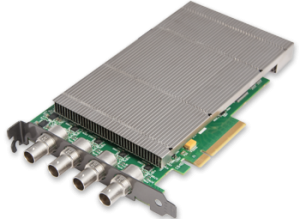 Ideal for use in broadcast markets or with any SDI capable applications the VisionSC-SDI4 provides four 3G-SDI inputs each capable of capturing 1920x1080p at 60 frames per second. Each capture channel is hardware timestamped allowing for larger surfaces to be captured and stitched together. For streaming applications, the VisionSC-SDI4 can be used with Windows Media Encoder to compress and stream captured video. To replay the video, use Windows® Media Player.